In 2010, Hal “Holiday” Schneider received an e-mail requesting permission to use his song “Booze Party” in the 2011 Australian film Red Dog. The song was written and recorded by his band Three Acres & a Joker more than 50 years ago. Though he might not be a household name, “Booze Party” has appeared on 13 albums, and Schneider himself still performs regularly and judges for Talent Quest in Laughlin, Nev., every year. 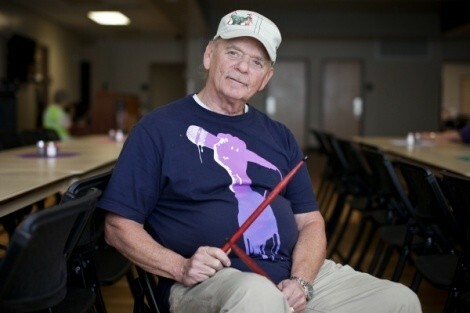 On Thursday, June 23, at 7 p.m., he’ll performing with 11 other bands and singers at the Ogden Amphitheater (343 E. 25th St., Ogden) for the free eighth-annual Hal Holiday Schneider Revue. Did you think that “Booze Party” would become such a hit when you wrote it? Honestly, I thought the run was over; I was never getting any royalties from it. It’s a big drinking song in Europe, but I didn’t think they listened to it in Australia. I feel honored. Not many people can do something that’s gone around the world. It didn’t make me rich, but I’m really not worried about that. I still play with the lead guitarist from that record every Tuesday, Wednesday and Friday; we play at this senior center in Washington Terrace. So, I feel real good about that—we’ve been together a long, long time. When did your music career begin? I was stationed here at Hill Air Force Base, and I was playing with a group called Rhythm Rockers. I used to play tenor sax. During the weekends, the guys would go out to the clubs in town. Most of the clubs played Western music, but I never sang Western music. So, we went to this place called Paris 89, and the guys would go up to the band and say, “You gotta get this guy Hal up to sing.” After about the third weekend of singing at the clubs, they asked me to join their band, but I play the tenor sax and it just doesn’t fit. They asked me to become their drummer, so I went down to Glenn Bros. music store in Ogden and bought a set of drums for $157 dollars. I’ve been playing drums and singing ever since. Why did you stop touring? Is it difficult to judge musicians on Talent Quest? Well, I know now that stage presence matters; it’s really important. I’ve always been a mover on the stage. It’s what you generate to the crowd that you get back. If you’re going to sing a moving song, move. If you’re going to sing a sad song, I want to see tears dripping down your cheeks. You have to elevate the emotions of the crowd through your stage presence. You got to put something in that generates the audience. That’s the difference between entertaining and being a singer. I look at it this way: I feel music, I live music, I cry for music. If I want to see a band perform, I want to be emotionally lost in it. And music is such a good way to communicate—just think if the whole word went around singing their hellos. They wouldn’t have time to fight and hate; it would be just a happy little world. Well, at least that’s the world I live in. How did you get the name Hal “Holiday”? I was playing at a place called El Chico in Ogden, and the owner was Greek. I wanted my stage name to be Haliday—Hal Haliday—but when he called it in to the newspaper, it sounded like he was saying Hal Holiday. So, it came out in the newspaper as “Hal Holiday,” so I just stuck with it. After Three Aces & a Joker, I formed my own band and we toured all through the Northwest. My twin brother and I called ourselves The Holiday Brothers. I like it. Now, it’s not like I’m retired—I don’t know how I even retired! Every day, five days a week, I sing for the seniors. Me and my daughter and her friends, we go around to a lot of the assisted-living places. We set up a machine and we sing for them and they love it. We feel good doing it because these people enjoy it. It’s like giving back to the community where I became popular. I have this feeling that what they like is what I sing. I’ve always been that way: You got to play what the people enjoy. I never sang “Harbor Lights” before now. The day that I come here, and I feel that they’re not enjoying it, I’m not going to do it anymore.